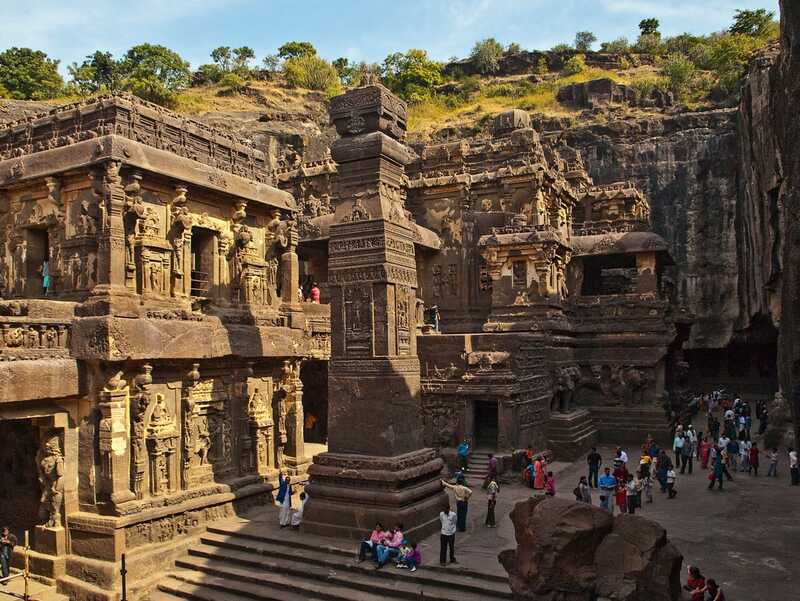 The last great cave temples of India are Ellora Caves – group of 34 monasteries and temples made at the ancient trade route between the nearby Paihan and the important city of Ujjain. Not that many know that in total in this area there are more than 100 rock cut caves but these 34 are located closer together (their entrances are spread along the cliff face for a bit more than 2 km), have a common interesting history and magnificent architecture and art. These "royal" caves were hewn in the vertical basalt cliff of the Charandri hill (Sahyadari Hills) sometimes around 630 – 1000 AD. Some sources state that some caves are older – from 550 AD. 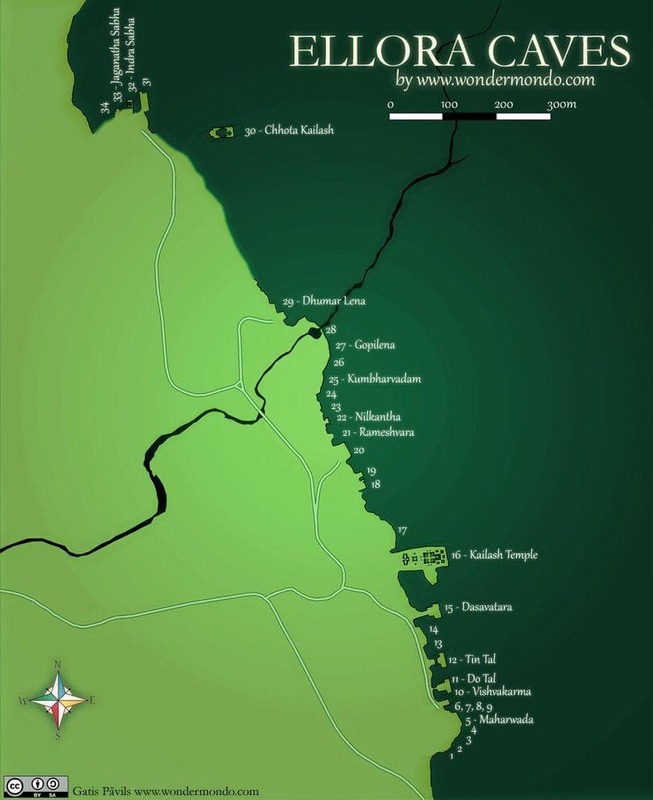 Caves are numbered from 1 to 34 starting from the south-east to the north-west. In Ellora Caves, this numbering means much more than just simple numbers attributed by scientists for the convenience. In general smaller numbers here mean older caves with somewhat less elaborate interiors, while a larger number is attributed to a newer cave which has more exquisite sculptures and other artwork. 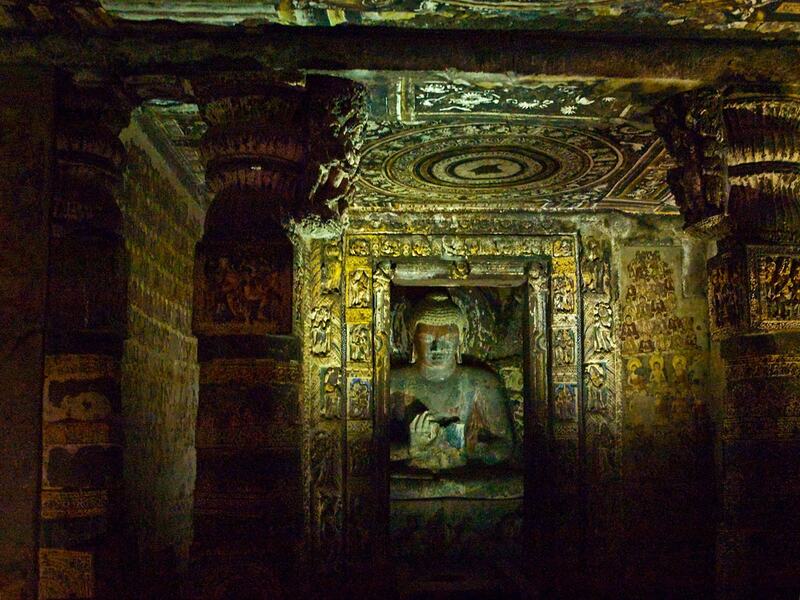 While the previous giant achievement of ancient Indian civilization – Ajanta Caves – has a more impressive natural setting and is more ancient (what also is a value), Ellora is even more rich with art than Ajanta. Knowing how incredibly rich are Ajanta Caves this might seem impossible – but this is a fact recognized by numerous visitors to both sites. Rashtrakuta dynasty ruled in large part of contemporary India in the 6th – 10th centuries. These powerful clans had an excellent internal organization. They managed to keep control over the vast area with a sure hand, wisdom and also skilled use of religion as the organizing institute for society. In these times Central India experienced a gradual shift from Buddhism to Hinduism, at the end of this period, Jainism became more widespread. These religions rather peacefully co-existed in Central India and Ellora Caves serve as one of the best examples for this. Ellora, especially the glorious Kailasanatha Temple is the highest architectural attainment throughout the rich history of art during the time of this dynasty. 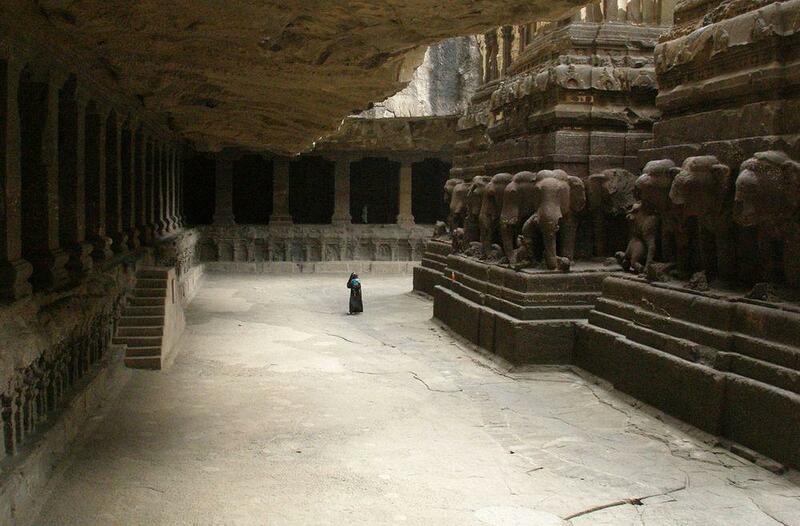 First caves in Ellora were created shortly after the previous royal shrines of this region – Ajanta Caves – were abandoned. 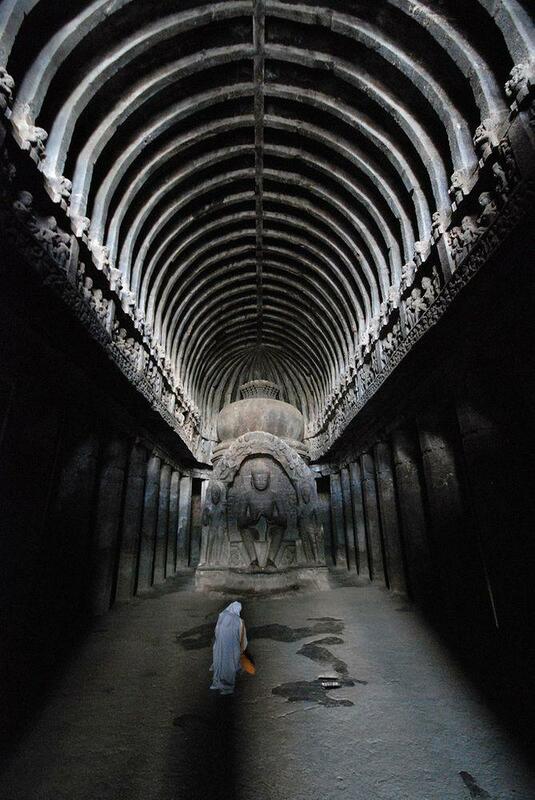 In many aspects, Ellora Caves continue the tendencies originating in Ajanta, but there are numerous influences from other regions of India and new trends in art represented in Ellora. The first group of shrines was created by Buddhists of Mahayana branch. These are caves numbered from 1 to 12 and were built in 630 – 700 AD (some sources state that in 400 – 800 AD). Next group was created when the influence of Buddhism vaned and Hinduism gradually became the mainstream religion. 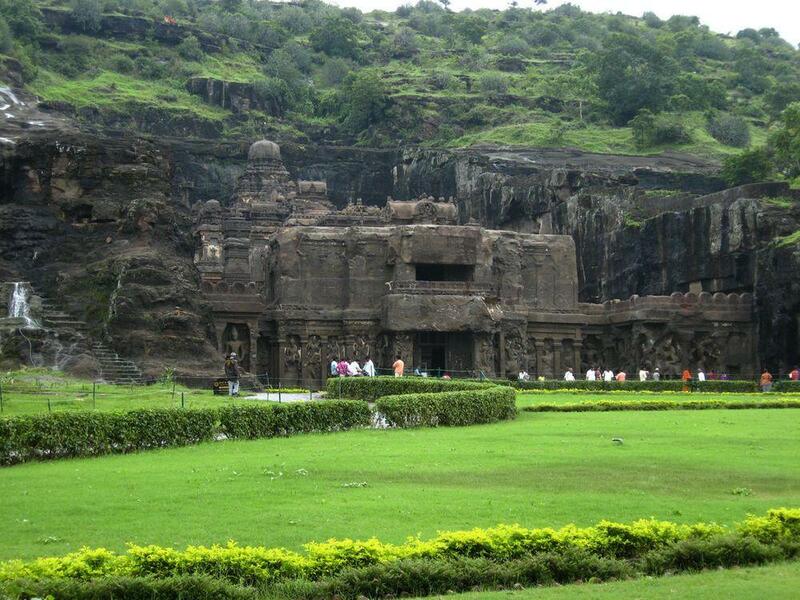 In fact, some of Ellora Hinduist shrines are older than some Buddhist caves. Local rulers were more supportive to Shaivism – a trend of Hinduism devoted to Shiva – thus also Ellora got exquisite shrines devoted to Shiva. These caves are numbered 13 – 29 and built in 550 – 780 AD (other sources state that in 600 – 900 AD). Cave temples hewn in rock were considered to be the best possibility to go away from the reality of the material world and meditate close to the heart of the mountain. But these caves were not another reality hidden away from the mundane world – they formed a part of political ambitions of the people of influence, they served as intellectual and arts center of Central India. There is no place for illusions about this chapter – words can not describe the incredible richness of artistic and philosophical messages emanated by thousands of sculptures, drawings, and inscriptions in Ellora. Below you will find just an attempt to list the caves and outline some of their values. Cave 1 – vihara with eight small cells. Possibly served as a granary for other viharas, comparatively simple design with little adornment. 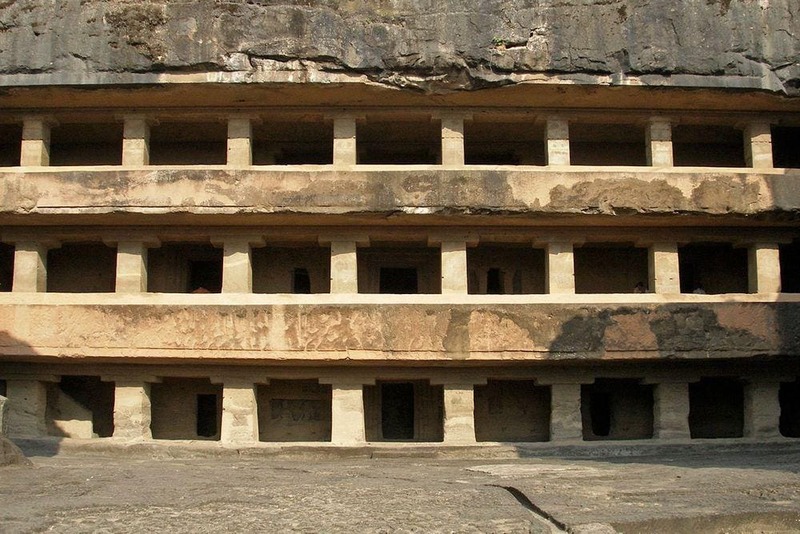 Cave 2 – large vihara with enormous central chamber supported by 12 square pillars. Adorned with numerous sculptures of seated Buddhas. Cave 3 and Cave 4 – similar to Cave 2, in poor condition. Cave 5 (Maharwada) – the largest vihara. Named after local Mahar people – they used this enormous chamber as a hideaway during the monsoon. Central hall is 36 meters long, contains sculpture of seated Buddha. Cave 6 – created after 600 AD. Among other values contains two beautiful sculptures of star goddess Tara and goddess of learning Mahamayuri with peacock. Cave 10 (Vishvakarma, Visvakarma, "Carpenter’s Cave", Sutar-ka-Jhopda, Sutar-ki-Jhopari) – the most famous local Buddhist cave, chaitya griha. 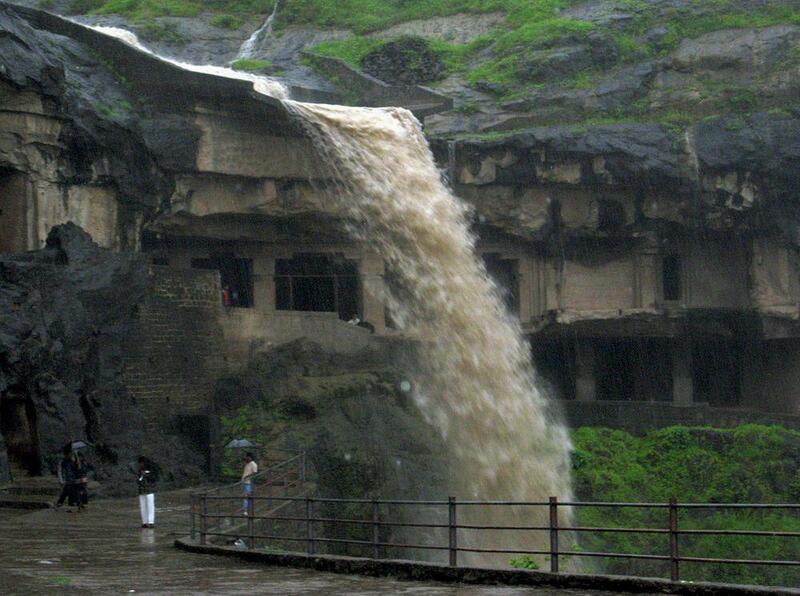 Built around 700 AD.Cave has a beautiful multi-storeyed entrance with two pillared side porticos. They have chambers – possibly intended to be sanctuaries but not completed. Behind the entrance there is enormous chaitya (shrine). Columns in the main hall have ghata-pallava (vase and foliage) capitals. Main hall has central nave and two side aisles – separated by 28 octagonal columns.Vaulted roof of chaitya has the characteristic ribs – resembling wooden architecture and used in many other cave temples.In the rear end there is 3.3 m high Buddha statue seated in preaching pose. Behind Buddha on the rear wall there is carved large Bodhi tree.Initially cave had a high screen hall, now ruined. Cave 11 (Do Tal or Dho Thal – „two storeys”) – vihara, one of latest Buddhist structures here, with three storeys. Third, basement storey was discovered in 1876. It has been converted to Hinduist shrine as witnessed by images of Durga and Ganesh. Buddha shrine has been left intact. Cave 12 (Tin Tal or Teen Thal – „three storeys”) – vihara, one of latest Buddhist structures here, with three storeys. Upper hall contains five large sculptures of bodhisattvas, hall is flanked by seven Buddhas. Built sometimes around 550 – 780 AD (or 600 – 870 AD? ), numbered from 13 to 29. Three oldest caves (17 – 29) were built during the time of earliest Kalachuri dynasty well before Rashtrakuta dynasty. The oldest are caves 28, 27. Ellora Hindu temples were created during the time of prosperity and serve as magnificent testimony to high achievements of Indian civilization. Cave 14 – carved in the early 600s, contains exquisite stone carvings – friezes. 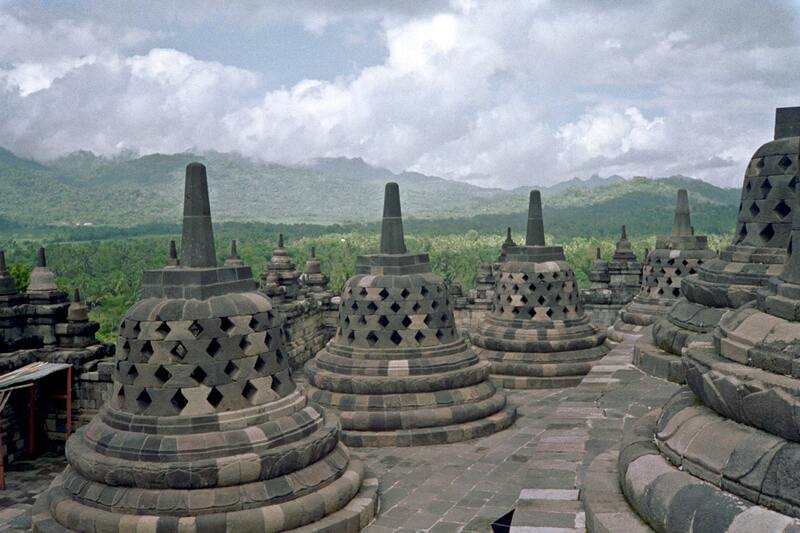 Initially was shaped like a Buddhist vihara but during the work converted to Hindu shrine. Entrance guarded by river goddesses Ganga and Yamuna. Cave 15 (Dasavatara – Cavern of the ten avatars) – built in the middle of the 8th century, two floors. The upper floor contains some of the most exquisite carvings. Initially started as a Buddhist vihara – it was shaped like an open court with free-standing monolithic mandapa with two-storeyed cave temple at the rear. The cave contains exquisite sculptural groups depicting scenes of Hindu religious motifs including panels with five of Vishnu’s ten incarnations – avatars. Contains also one of the famous Hindu artworks – Shiva as Nataraja, the Cosmic Dancer. Cave 16 (Kailash Temple, Kailasanatha) – one of the highest achievements of ancient architecture worldwide, designed to resemble Mount Kailash – the abode of Lord Shiva. 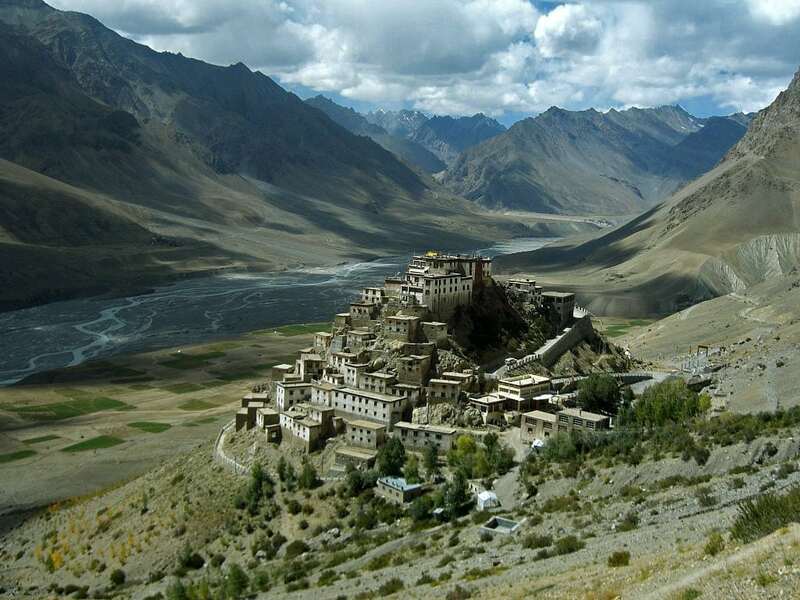 Created sometime around 760 – 860 AD, started during the reign of Rashtrakuta king Krishna I (ruled in 757 – 773). 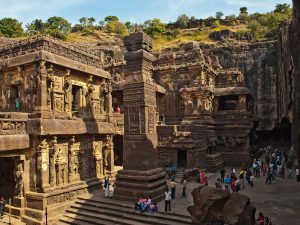 Although technically sculpted out of a single rock, Kailash Temple is a free-standing structure with many stories, two times larger in area than, f.e. Parthenon in Athens. It is the largest monolithic human-built structure of the world, up to 36,6 meters high. Length of structure – 84,1 m, width – 47 m.
Art historian Sharada Srinivasan considers that the work at such cave temple was started by leveling the area above the temple and exactly measuring the silhouette of the future temple from above. After that artisans started to carve down the rock as if it was cheese, immediately carving elaborate sculptures. Debris possibly was removed over temporary rock bridges. It is assumed that the construction of this temple took 100 years starting from around 760 AD, 200,000 tonnes of rock were removed. This required extremely good planning and precise work to avoid damage to completed work. Initially, Kailasanatha was covered with thick, white colored plaster, thus resembling the sacred icy Kailash mountain in Tibet. Temple starts with high entrance gate or gopuram. It serves as a screen between the sacred temple and the outer world. Behind the gopuram, there opens a courtyard with three stories high columned galleries. In the middle of this courtyard stand several buildings – also hewn out of the same monolithic cliff. Earlier there were flying bridges connecting galleries with the structures in the center but these have collapsed now (or removed after the construction works were completed?). First, after the gopuram is a 7 meters high shrine to bull Nandi with two monolithic towers – Dhvajastambhas – flanking it. Next, behind the Nandi image there is the largest structure inside the temple – large mandapa – hall of the temple and the main shrine of Kailash Temple, called Nandi Mandapa. Temple over the shrine rises up to 29,3 m high and stands on 16 pillars. Initially, the temple was colored in bright colors, today nearly all color is gone. Only a few paintings remain on the ceiling of mandapa. On existing remnants, it is seen that the painting has been done three times at least. The giant mandapa is held by numerous life-sized elephants – also carved out of the original rock! This artistic method originates from Pitalkhora Buddhist caves, the 2nd century BC and later has been repeated in many artworks. Adjoining the mandapa is the last structure inside the courtyard – Shiva temple. 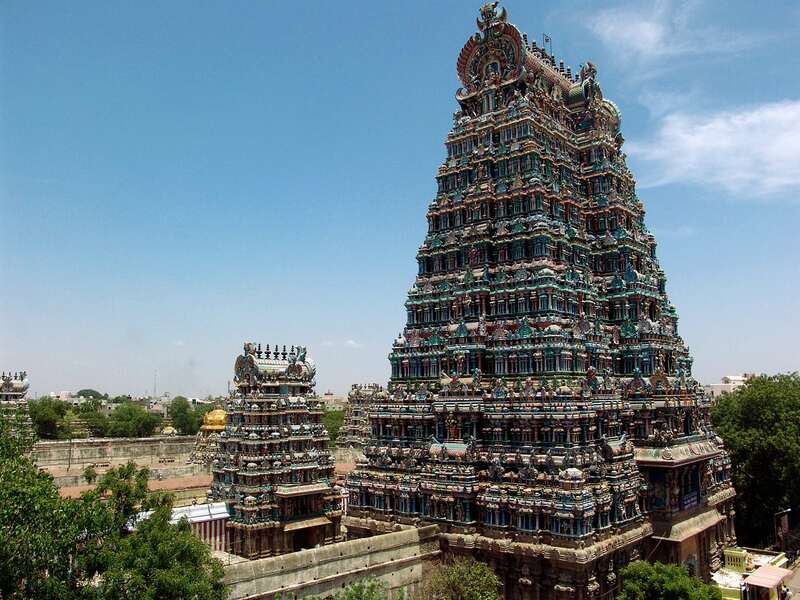 It is formed like a pyramid, resembling South Indian temples. Both Nandi Mandap and Shiva temple are housing lingams. Southern Indian influences in the architecture of Shiva temple could be explained by presence of Southern Indian artists – the state governed by the Rashtrakuta dynasty included also part of Southern India. Shiva temple has many similarities to South Indian Virupaksha Temple at Pattadakal which was made several decades earlier. Cave 21 (Rameshvara, Ramesavara) – possibly the oldest Hindu cave in Ellora, from the late 500s. Contains some of the most beautiful carvings. At the far end of entrance verandah two beautiful figurines of river goddesses Ganga and Yamuna. Cave 22 (Nilkantha) – contains beautiful stone carvings. Cave 25 (Kumbharvadam). Contains beautiful sculpture of Surya – Sun god – driving his chariot towards the dawn. Cave 29 (Dhumar Lena) – created in the late 6th century. Unusual, cross-shaped planning. 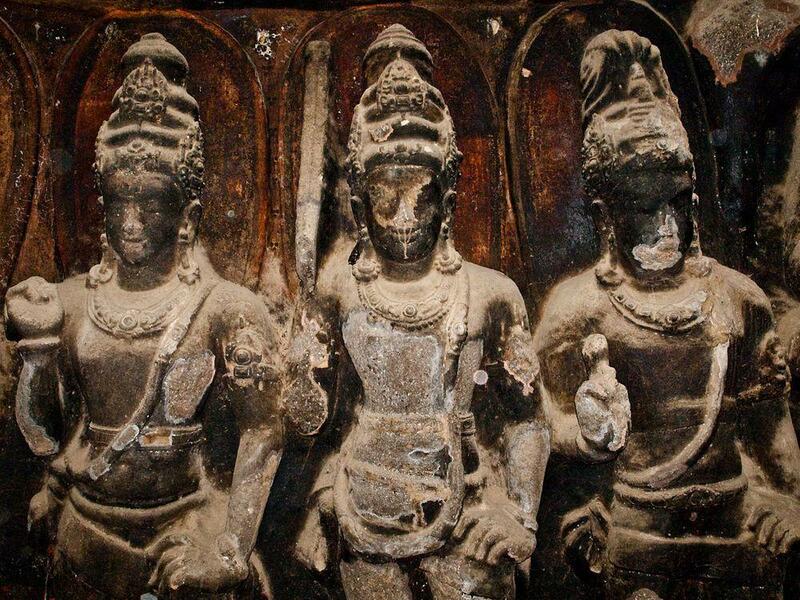 Contains enormous, beautiful sculpted panels with depictions of Shiva, other exquisite carvings. Creators of these last five temples draw much of inspiration from the older, existing temples. 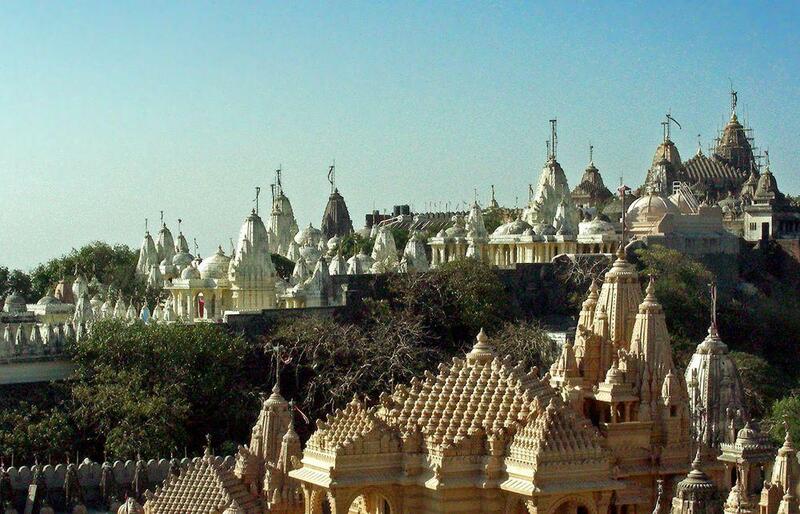 Jain temples are not large if compared to Hindu and Buddhist structures – Jain religion is the religion of asceticism. Jain stone carvings though are unsurpassed in quality and complexity. Earlier many stone carvings were covered with paint which for the most part is gone now. Cave 30 (Chhota Kailash) – smaller version of Kailash Temple with beautiful pillars. Cave 32 (Indra Sabha – Indra’s Assembly Hall). Extremely ornate, two floors. In the center, there stands monolithic shrine. The ceiling is adorned with an enormous carving of lotus. Contains remnants of a valuable mural which in its artistic technique shows the beginning of the medieval period in Indian painting. Sculpture of naked Gomateshwara who stands to meditate in a forest without noticing how the vines have grown and twisted around his legs and scorpions and snakes crawl around him. Cave 33 – contains remnants of valuable mural which in its artistic technique shows the beginning of medieval period in Indian painting. Cave 34 – small and can be accessed only through the opening in Cave 33. Here, for the first time, American architect Roger Vogler examines this great Hindu temple carved downward from the top of a hillside in Maharashtra from the perspective of his fellow architect: the unknown sthapati who actually designed it thirteen centuries ago.